This article was first published in the Marketer – Journal of the Society for Marketing Professional Services (SMPS). Also read Omnichannel Marketing: Catching Up to the Future of B2B. In today’s fully digital world, synergy between data, content, and channels is a must. The “digital-first” mindset calls for new tools and the strategic expertise to leverage technology without getting caught up in the hype and neglecting to give customers what they actually need and expect. Marketer 2.0 is a savvy strategist who combines new thinking, approaches, and skills with the right technology stack to plan, execute, measure, and optimize marketing campaigns. 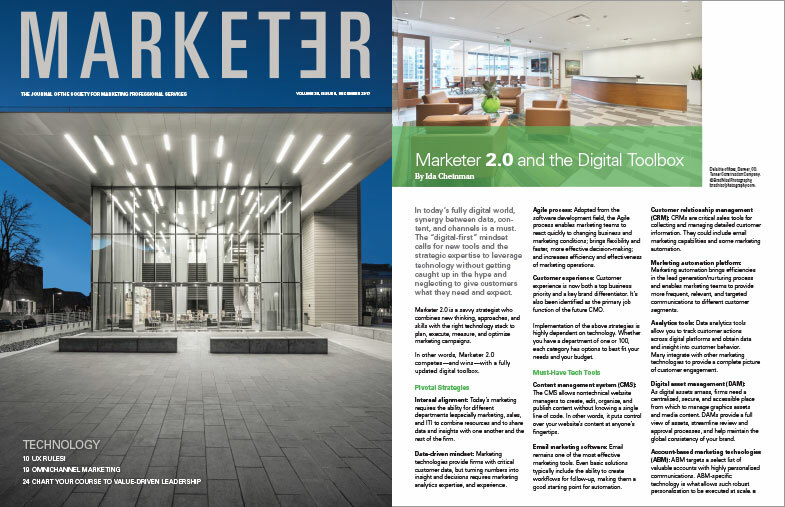 In other words, Marketer 2.0 competes – and wins – with a fully updated digital toolbox. Internal Alignment: Today’s marketing requires the ability for different departments (especially marketing, sales, and IT) to combine resources and to share data and insights with one another and the rest of the firm. Data-Driven Mindset: Marketing technologies provide firms with critical customer data, but turning numbers into insight and decisions requires marketing analytics expertise and experience. Agile Process: Adopted from the software development field, the Agile process enables marketing teams to react quickly to changing business and marketing conditions; brings flexibility and faster, more effective decision-making; and increases efficiency and effectiveness of marketing operations. Customer Experience: Customer experience is now both a top business priority and a key brand differentiator. It’s also been identified as the primary job function of the future CMO. Implementation of the above strategies is highly dependent on technology. Whether you have a department of one or 100, each category has options to best fit your needs and your budget. Content Management System: The CMS allows nontechnical website managers to create, edit, organize, and publish content without knowing a single line of code. In other words, it puts full control over your website’s content at your fingertips. Email Marketing Software: Email remains one of the most effective marketing tools. Even basic solutions typically include the ability to create workflows and automate follow-up, making them a good starting point. Customer Relationship Management: CRMs are critical sales tools for collecting and managing detailed customer information. They could include email marketing capabilities and some marketing automation. Marketing Automation Platform: Marketing automation brings efficiencies in the lead generation/nurturing process and enables marketing teams to provide more frequent, relevant, and targeted communications to different customer segments. Analytics Tools: Data analytics tools allow you to track customer actions across digital platforms and obtain data and insight into customer behavior. Many integrate with other marketing technologies to provide a complete picture of customer engagement. Digital Asset Management: As digital assets amass, firms need a centralized, secure, and accessible place from which to manage graphics assets and media content. DAMs provide a full view of assets, streamline review and approval processes, and help maintain the global consistency of your brand. Account-Based Marketing Technologies: ABM is a strategy that targets a select list of valuable accounts with highly personalized communications. ABM-specific technology is what allows such robust personalization to be executed at scale.